Tableau comparatif des principales hauteurs du globe. 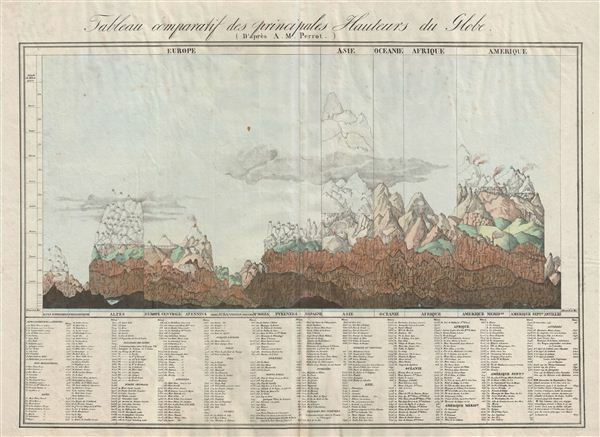 An unusual, early, and interesting take on the comparative mountains of the world chart. This chart, drawn by Perrot in 1827, compacts an incredible amount of information in very little space. Perrot's primary goal was to show the relative elevations of the world's greatest mountains both as a whole, by continent, and by range. The left hand side of he chart focuses on the great european mountain ranges, the Alps, the Apennines, the Pyrenees, and the lesser ranges in Britain, Jura Spain, and Vosages. The right hand side of the chart focuses and the more lofty summits of Asia, Oceanie, Africa, and America, which is in turn subdivided into North America, South America, and the Antilles. Standing above the fray, nearly twice the heights of any other ranger, are the almost ghostlike Himalayas. each mountain is numerically referenced with exact elevations notated in a table at the base of the chart. A quick review of these reveals the relatively primitive state of alpine exploration in the early 19th century. As everest had yet to be discovered, the largest mountain in Asia is identified as Dhaulagiri at 8556 meters. Chimborazo, of Humboldt fame, is the largest mountain in the Americas as dome 6530 meters – the great peaks of Chile and Argentina being as yet unknown. In Africa, with both Kilimanjaro and Mt. Kenya undiscovered, Geesh, in modern day ethiopia, is listed at the greatest peak. even the ballooning feat of Gay-Lussac who attained an altitude of 7000 meters in 1808 is noted. This chart was published for Vandermaelen's impressive 1827 Atlas universel de geographie physique, politique, statistique et mineralogique. Aristide Michel Perrot (1793-1879) was a French geographer active in the early 19th century. Perrot specialized in miniature maps and his work is featured in a number of French themed early 19th century atlases. He was also a noted watercolorist. Little else is known of Perrot or his life. Philippe Marie Guillaume Vandermaelen (December 23, 1795 - May 29, 1869) was a Flemish cartographer active in Brussels during the first part of the 19th century. Vandermaelen is created with "one of the most remarkable developments of private enterprise in cartography," namely his remarkable six volume Atlas Universel de Geographie. This great work, featuring some 378 unique maps and compiled over three years, was the first atlas to render the world on a uniform scale. Vandermaelen was born in Brussels in 1795 and trained as a globe maker. It was no doubt his training a globe maker that led him see the need for an atlas rendered on a universal scale such all bodies could be understood in relation to one another. Conjoined the maps of Vendermaelen's atlas would create a massive globe some 7.75 meters in diameter, a feat which was accomplished at the Etablissement Geographique de Brussels. Vandermaelen's atlas also bears the distinction of being one of the first to be produced by a lithographic print process. In addition to his great work Vandermaelen also produced a number of globes, lesser maps, a highly detail 250 sheet map of Belgium, and several regional atlases. Vandermaelen, Ph., Atlas universel de geographie physique, politique, statistique et mineralogique..., 1827. Very good. Original centerfold. Some warping of paper. Else clean.